Just when you think our cast couldn’t be anymore perfect, we get something like this. 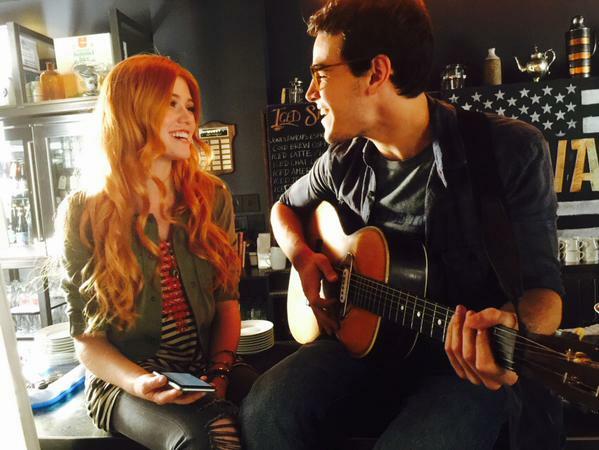 Shadowhunters executive producer McG shared a video from filming on day 4 of the pilot episode, which features our Clary and Simon Katherine McNamara and Alberto Rosende singing for the fandom. Seriously, how talented is our cast?! McG also tweeted out this photo of our holy trinity, Clary, Jace and Simon. SWOON. Shadowhunters is currently filming in Toronto and will premiere in early 2016 on ABC Family. So beautiful, so beautiful! The cast are more than actors pretending to play a character. They are people who bring to life the greatest heroes ever! Can’t wait!!!! Thoughts on the Malec picture?? Personally just the eyes are irking me a lot. Please blue for Alec and cat eyes for Magnus please!! Reblogged this on Books and stuff.